Conservative Leader Andrew Scheer rises during Question Period in the House of Commons on Parliament Hill in Ottawa on Feb. 7, 2018. Conservative Leader Andrew Scheer says he wants to create a firearms ombudsman to advocate for gun owners and that the RCMP should no longer have the power to reclassify guns – a proposal being dismissed as “nonsense” by the country’s former top cop. 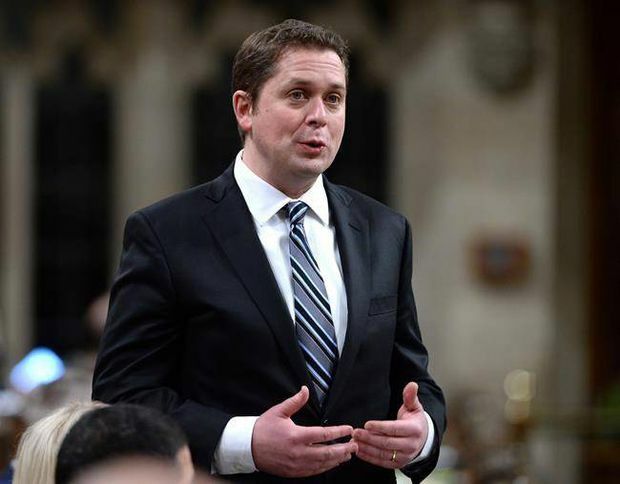 Mr. Scheer, the only federal party leader who owns guns, stands by the firearms policies he made during last year’s Conservative leadership race, his spokesman Jake Enwright said. Mr. Enwright refused repeated interview requests with Mr. Scheer, and said he couldn’t discuss what guns Mr. Scheer owns, what they’re used for or where they are kept. Mr. Scheer, who represents a Saskatchewan riding, lives at the Official Opposition residence Stornoway when he is in Ottawa. “Unfortunately for public safety reasons, I cannot disclose to you the types of firearms or where they’re located,” Mr. Enwright said. “There is a rabid firearms lobby that has their hooks into the Conservatives, and they’re aggressive, and the only way that, in my view, the political folks can keep them at bay, is to blame the RCMP,” Mr. Paulson, who retired last June after 32 years in the force, told The Globe. This month, the Liberal government promised to institute more vigorous background checks to get a licence to purchase firearms and, if Ottawa gets buy-in from provincial governments, the checks could include an examination of the purchaser’s mental-health history. As well, U.S. state governments have moved in recent weeks to restrict gun ownership following a series of mass shootings. Conservative MP Glen Motz, the deputy public safety critic, said he agrees with the concept of additional scrutiny for those who have shown “mental health challenges,” as long as it doesn’t slow down the process for others. “We do need to make sure that it’s balanced when this is put in place. That it’s not putting the burden on honest, law-abiding gun-owning Canadians,” he said. Mr. Scheer’s proposals, which were taken down from his website after he won the Conservative leadership last May, include stripping away the power of the RCMP to “arbitrarily make reclassifications” of firearms and give it instead to elected officials. Mr. Scheer discussed his rationale during a video interview last spring with the Canadian Coalition for Firearms Rights, which bills itself as the voice of Canadian gun owners and also lobbies politicians. “One of the major complaints I hear about the existing regime is that the RCMP are the deciders of a lot of aspects of firearms rules, and they’re also the entity that we entrust to enforce the law. And a lot of people said there’s a conflict of interest there,” Mr. Scheer said in the video, posted to YouTube last April, a month before he won the party leadership. Mr. Scheer also proposes the creation of a firearms ombudsman, who would act as an appeals mechanism for gun owners. “I would like there to be an entity, a person with some authority to interact with government, with officials, to advocate on behalf of firearms owners,” he said in the video. There are currently three classes of firearms in Canada: non-restricted, restricted and prohibited. Most common long guns are not restricted, while handguns can fall into either the restricted or prohibited category. The classifications are set out in the Criminal Code and corresponding regulations. Some gun owners, however, have complained that the force changes the classifications of firearms without notice or justification. In 2015, the Harper government reversed the RCMP’s decision to effectively ban the Swiss Arms and Czech-made CZ 858 rifles. In a statement on its website, the RCMP says, “It may occasionally appear that a firearm has been ‘re-classified.’ However, this term is not accurate.” The force said sometimes new information comes to light about a firearm that changes its classification, such as discovering it can be easily modified. “The RCMP works with firearms manufacturers and importers to determine the classification of firearms imported into Canada based on technical information and documentation provided by them,” RCMP spokeswoman Cpl. Annie Delisle said in an e-mail. In his platform, Mr. Scheer references a story about hunting whitetail deer with a friend’s .308 precision rifle, and later eating jerky. “As a firearms owner myself, I’m very sympathetic to the concerns that people like me face every day,” Mr. Scheer said in the video. Neither Prime Minister Justin Trudeau, nor NDP Leader Jagmeet Singh, own firearms, their offices said. Rod Giltaca, CEO and executive director of the Canadian Coalition for Firearms Rights who conducted the video interview with Mr. Scheer said the Conservative leader’s platform was a “middle of the road approach” for gun owners, although he agrees with the proposal to strip authority from the RCMP. “Our position has always been [to] get rid of the punitive measures on people that aren’t shooting anyone, and then focus all of that extra effort…on the people that are shooting folks,” he told The Globe. Editor’s note: This version has been updated to remove a reference to the kirpan worn by Mr. Singh.